Leading Manufacturer of static pass box and dynamic pass box from Ahmedabad. 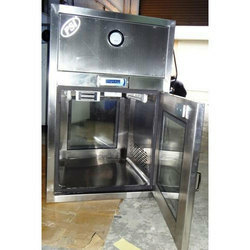 We hold expertise in Providing Static Pass Box that are designed to minimize traffic and contamination entering into clean room. Manufactured using quality material like Stainless Steel, these are based on the latest technology and easy to install. Pass Boxes offered by us is provide. U.V. Light, Florescent Light Hour Meter And Digital Inter Locking System. High-pressure centrifugal fan specialized for purification is installed on the top of pass box. Air supply on the top and air return on the bottom, cleaning off dust and dirt particles from material transfer. 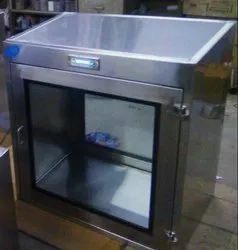 It enables materials to be moved between the clean room and other parts without damaging the cleanliness level of the products or materials, and also protect the surrounding area clean.